Hi there! Today I'm sharing a card I made for the Stamp It! Cards Birthday Challenge in the Moxie Fab World. 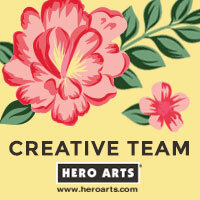 I heat embossed the Hero Arts Silhouette Vines image and colored in the flowers with colored pencils. The sentiment frame is from the Sending You Love stamp set. Love It!! Beautiful colors, the flowers are so nice! love the colors and your coloring--so pretty! Absolutely stunning, Kelly! Congrats on the win over Moxie Fab World! congrats on your win at MFW, kelly! and your HMs, too! you rocked the challenges, girl! Love the card and the colors are fabulous! SO pretty, Kelly! Your embossing is perfect and your colouring is so pretty too! Congrats on your win at MFW! You really rocked the MFW Stamp It challenges!!! This is wonderful!!! Love the coloring.